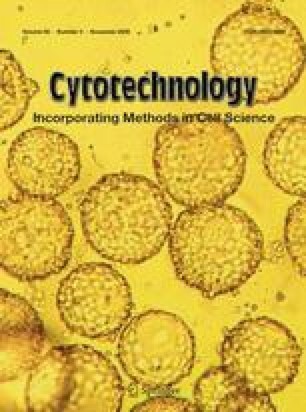 This study investigated conditions for optimal in vitro propagation of human skin-derived mesenchymal stem cells (S-MSC). Forty primary skin-derived precursor cell (SKP) cultures were established from both male and female donors (age 29–65 years) and eight of them were randomly selected for in-depth characterization. Effects of basic fibroblast growth factor (FGF-2), epidermal growth factor (EGF), leukemia inhibiting factor (LIF) and dibutyryl-cyclic adenosine monophosphate (db-cAMP) on S-MSC proliferation were investigated. Primary SKP cultures were >95% homogenous for CD90, CD73, and CD105 marker expression enabling to classify these cells as S-MSC. FGF-2 dose-dependent stimulation was observed in low serum medium only, whereas EGF neither stimulated S-MSC proliferation nor potentates the effect of FGF-2. Pronounced donor to donor differences among S-MSC cultures were observed in 3-day proliferation assay. This study demonstrates that homogenous S-MSC populations can be reproducibly isolated from individual donors of different age. Optimal cell culture conditions for in vitro propagation of S-MSC are B27 supplemented or low serum media with FGF-2 (4 ng/ml). EGF and LIF as well as db-cAMP are dispensable for S-MSC proliferation. We thank Dr. Stengrevics, Riga Eastern Hospital, and Dr. Jankovskis, Experimental and Clinical Medicine Institute, University of Latvia, for help with tissue samples, and Dr. Dambrova and Dr. Liepinsh from Latvian Institute of Organic Synthesis for collaboration. The presented work was supported by the European Regional Development Fund (ERDF) project No.VPD/ERAF/CFLA/05/APK/2.5.2./000072/036.